We are so happy to share this amazing stylized shoot with you all today! 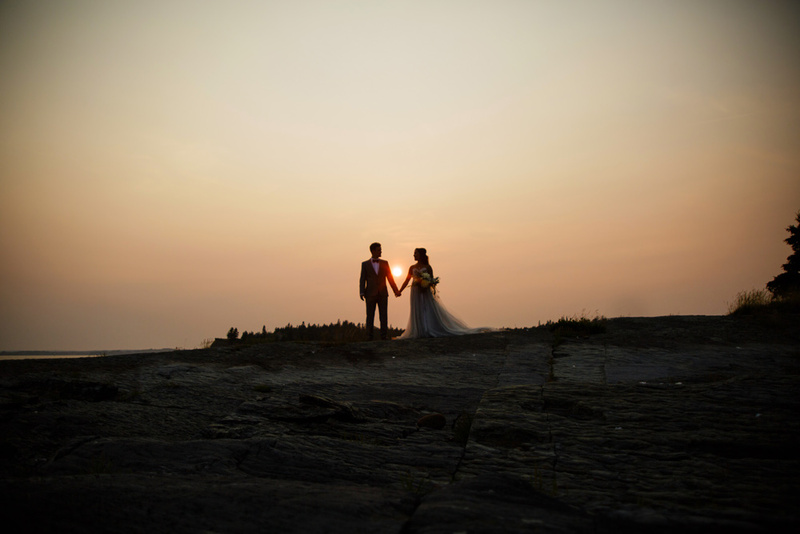 The inspiration for this shoot was to showcase the stunning little province that we call home! I was thrilled when my good (and uber talented) friend Stephanie Brown of Sky's the Limit Design agreed to design the magical tablescape, decor and general loveliness you see below. I always love working with Stephanie because she has tons of amazing suggestions and ideas... and she is hilarious. We also had Bee Stanton of Beejaedee making the most exquisite hand illustrated stationery. Bee is a talented artist and everyone should check out her work. Bee was also a sweetheart and came to set to help out! As you can tell we had a lot of fun on set with so many wonderful people involved. Katrina Tuttle Bridal was an essential part of this shoot. Below you are going to see the most beautiful custom grey wedding dress! I could swoon over that dress all day long. The beautiful fabric, the soft nuances of shades of grey in the draping! Ugh my heart skips a beat! Katrina was a magician and created a dress more beautiful than I could have imagined! Katrina's assistant Tiana was there dressing the models and making life easier :) Love ya Katrina and Ti! Hosting this shoot was the amazing Boscawen Inn in Lunenburg. I simply can't say enough good things about each and every experience I had with them. From sipping tea with Judy (one of the owners) to helping to plan out the shoot. Working with them was just amazing and I can't recommend them enough. I'm beyond thrilled to be capturing several weddings next year at their lovely historical inn. We also had the beautiful work of Charlotte from The Flower Shop. She designed the most epic bridal bouquet I have ever seen! You can thank her creativity and hard work for all the beautiful flowers and greenery you see below! For the Bride's looks we have so many vendors that came together to make all the bride looks complete! First, we have milliner extraordinaire Nicole McInnis of OH DINA! making a stunning custom sash for her bride. Her stunning and unique work is a must-see! We also had Selena Marchand Makeup Artistry do the Bride's makeup. She did an amazing job matching the colours of the shoot. Selena's company Harper and Honey design also provided the earrings for the shoot. You will also see Tori XO's beautiful key necklace. Tori's handcrafted pieces are just so amazing I'm rarely leave the house without one of her pieces on. You can thank Cocoa Organic Spa for the perfect bridal manicure! Ashley and her team always give the world's best manicures. I can't recommend them enough! Finally, I want to thank our lovely models Raquel and Matt for being a part of the day! They are a beautiful couple in real life with a wicked sense of humour. Thanks to East of Ordinary Design for Matt's custom black velvet bow tie. And last but certainly not least thanks to Mike Bernier Photography for his help in finding the beach locations for the shoot. Nicole McInnis - OH DINA!